The National Water Trail System defines water trails as “recreational routes on waterways with a network of public access points supported by broad-based community partnerships”. They provide conservation, recreational, and tourism/economic development opportunities and are focused on boaters, especially paddlers (kayaks, canoes, standup paddleboards, etc.). The Draft Cayuga Lake Blueway Trail Plan identifies the existing conditions along the lakeshore for paddlers; assesses regional assets; identifies gaps in access areas, and proposes locations for short term and long-term improvements and launch sites. 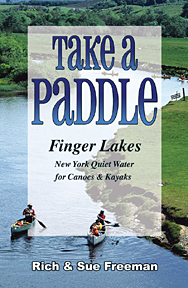 It also describes opportunities to market Cayuga Lake as a paddling destination and lays out a variety of possible paddling itineraries, destinations and experiences on the lake for all abilities and preferences, from day trips to multi-day overnight adventures. Comments can be submitted through the plan’s website directly until November 12th. http://cayugablueway.weebly.com/. Comments may also be submitted via email to Tom Knipe in the Tompkins County Planning Department, tknipe@tompkins-co.org. All comments received by November 12th will be considered as the plan is completed. The Final Cayuga Lake Blueway Trail Plan will be released before the end of the year, and it is expected that a coalition of partners from Cayuga, Seneca and Tompkins Counties will begin work on implementing the Plan in 2014. The Nature Conservancy & U.S. Fish and Wildlife agreed to remove an old, unneeded dam from Reynolds Gully, a high-quality stream that provides habitat for native brook trout and flows eventually into Hemlock Lake, the near-wilderness lake that provides Rochester with drinking water. That stretch of Reynolds Gully passes through a 310-acre parcel the conservancy owns near Hemlock Lake, which is in Livingston County about 30 miles south of Rochester. The group hopes to add the property to Harriett Hollister Spencer State Recreation Area, which lies between Hemlock and nearby Honeoye Lake on Ontario County. Watkins Glen State Park has the type of setting I would expect to see in a fantasy film rather than Upstate New York. 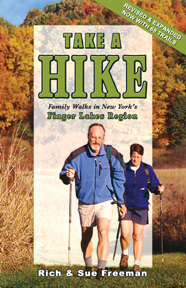 This trail is located at the tip of Seneca Lake and is less than an hour and a half away from Rochester, New York. Watkins Glen State Park has a reputation of having the most beautiful scenery and breathtaking views. The park is divided into two sections: the deep shale and limestone glen that the park is known for, and the upper park, which is filled with picnic, camping and recreation facilities. The hike is about two miles long and consists of numerous 200-foot cliffs that generate 19 graceful waterfalls along its course. The gorge path allows hikers to stroll behind these waterfalls and provides a truly amazing view. Campers and day-visitors can attend scheduled summer tours through the gorge, swim in the Olympic-size pool and spend the night at tent and trailer campsites nearby. Visitors can also picnic or fish near Seneca Lake. The Watkins Glen trail is the center of attention in this city and leads visitors through various cliffs and scenery. The view of this gorge is beyond anything that I had imagined. I honestly was not expecting such an impressive and break-taking view at Watkins Glen. The journey begins in the lower parking lot, which is actually where the massive mouth of the glen lies. This trail put me in a world of serenity with calm flowing water, birds singing above, gentle breezes and natural stone. On the hot summer day I was there, the gorge provided coolness and surprising elegance as I hiked up this long trail. My favorite aspect of the path at Watkins Glen was a spot called “Lover’s Lane”, which was the most unique scenery I had ever witnessed. At this location, it looked as though the water had torn away at the rocks and made a heart-like shape. I witnessed many couples taking pictures at this particular spot. As the sun shined on the marvelous aspects of the trail, I had many opportunities to take pictures that would last me a lifetime. Some of the cliffs were pretty high. There were a lot of steps, so be prepared if you are terrified of heights! It took me about an hour to hike up the entire thing, but no worries – there is a shuttle to take visitors back to the ground or up to the top if preferred. I would not recommend wearing sandals or flip-flops due to mud or wetness on some parts of the trail, especially the waterfalls. Aside from the gorge, I tented at one of their campsites. The staff was extremely friendly, helped us carry firewood back to our campsite and provided us with any information we needed. The camping site was roomy and contained a grill and electricity. The bathrooms were clean and there were many of them around the camp. The Olympic-size swimming pool is definitely worth the time out of a vacationer’s day and the water was clean and clear. The Seneca area is known for its wineries, and some even offer casual dining and gift shops. There are plenty of ice cream parlors nearby, along with the village’s waterfront park for you to enjoy the scenery. The Watkins Glen Gorge Trail is the heart of the park and is why people travel there year after year. Although it is tucked away in upstate New York, Watkins Glen is an attraction worth visiting. This camping trip was one of the most enjoyable vacations I had ever taken, so plan a day and visit Watkins Glen!